The history of wind power goes back a long way. Sailing ships have been using wind power for at least 5,500 years. Architects used wind-driven natural ventilation in buildings starting around the same time. The earliest reference to a windmill in the history of wind power was in the 1st century AD. It was used to power a pipe organ. Windmills were further developed to automate the tasks of grain-grinding and water-pumping. The earliest design was the vertical axis system. It was developed in Persia around 500-900 A.D. 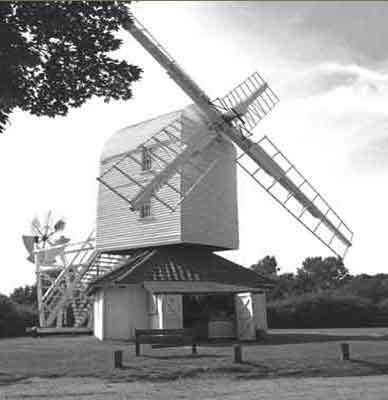 Grain grinding was the first recorded windmill application. A grinding stone was affixed to the vertical shaft to grind wheat and other grains. The mill machinery was usually enclosed in a building. China is often claimed as the birthplace of the windmill in the history of wind power - however the earliest documentation of a Chinese windmill was in 1219 A.D. This was well after the Persian windmill. The first windmills to appear in Western Europe's history of wind power were of the horizontal-axis configuration. The reason for the sudden evolution from the vertical-axis Persian design is unknown. It is suspected that the European water wheel served as a technical model for the early European windmill. These tower mills used wooden cog-and-ring gears to translate the motion of the horizontal shaft to vertical movement to turn a grindstone. As early as 1390, the Dutch set out to refine the tower mill design. The Dutch essentially affixed the standard mill design to the top of a multi-story tower. The tower was designed with separate floors devoted to grinding grain, removing chaff, storing grain, and living quarters for the windsmith and his family. These early windmills had to be oriented into the wind manually. This was done by pushing a large lever at the back of the mill. Optimizing windmill energy, and protecting the mill from damage during storms, were the windsmith's primary jobs. The process of perfecting the windmill took some 500 years. By the 19th century windmills had all the major features crucial to the performance of modern wind turbine blades. Between 1850 and 1970, over six million "American" multi-blade windmills were installed in the U.S. They were used mainly for pumping water for livestock, and other farm water requirements. This type of windmill is very familiar. It is the "typical" old windmill people usually think of - the blades rest on a wheel and it has a tail to keep the fan pointed into the wind. The "American" multi-blade windmill was used for the first large windmill designed to generate electricity - late in the 19th century. In 1888, Charles F. Brush built the first large windmill to generate electricity in Cleveland, Ohio. Whilst it operated for 20 years, the Brush windmill had too many limitations for large scale electricity production. The 17 meter rotor only produced 12 kilowatts - a tiny amount when compared to the 70-100 kilowatts produced by a comparable modern rotor. The 20th century interest in wind power was driven by the increasing use of electricity, coupled with fossil fuel shortages. This led to the further development of wind power. Dane Poul La Cour developed the first electrical output wind turbine which incorporated the aerodynamic design principles used in the early European windmills. In 1891, the higher speed of the La Cour rotor made it suitable for electricity generation. It was capable of a 25 kilowatt electrical output. By the end of World War I, the La Cour rotor had spread throughout Denmark. Unfortunately, cheaper fossil-fuel driven steam plants soon put the windmills out of business. Temporary shortages of fossil fuels following World War II led to continued European development of rotor technology. Just as solar power technology advanced during the oil embargo of 1973 - 1974, the history of wind power also jumped ahead in leaps and bounds. During this period, Westinghouse Electric Company received Department of Energy (DOE) / NASA contracts for building large wind turbines. The largest capacity wind turbine was built in Oahu, Hawaii, with a 3.2 megawatt power rating. Over the period of 1973-1986, the commercial wind turbine market evolved. Wind turbines became popular for domestic and agricultural applications which utilized small turbines of the 1 to 25 kilowatt range. Wind farms interconnected to the electricity grid also flourished, typically installing intermediate-scale turbines of 50 to 600 kilowatts. Between 1981 and 1984, the US government offered a 25% tax credit for investments in wind turbines. As a result 6,870 turbines were installed in California alone. Tax incentives still exist today as the government still supports alternative energy use. Even from an individual person's perspective, rather than a mass wind farm, there are incentives to be had for pursuing wind energy use when they file their online tax return for the year. Over 17,000 wind turbines, ranging in output from 20 to 350 kilowatts, were installed in Californian wind farms between 1981 and 1990. These turbines had a collective capacity of over 1,700 megawatts - enough to power a city of 300,000 people. The change in prices of wind power electricity dropped from 14 cents per kWh in 1985 to 5 cents per kWh in 1994. This made wind power a viable competitor in the electricity market. Wind farms are increasing in popularity as an alternative energy option. Today's government and legislative groups are continuing to explore the potential of wind power. Global Wind Energy Council (GWEC) figures show that 2007 showed an increase of installed capacity of 20 gigawatts, taking the total installed wind energy capacity to 94 gigawatts. The annual market for wind energy continues to increase at an estimated rate of 31% annually. This all suggests that wind power will continue to gain popularity as both an environmentally friendly and economically viable energy source. Consumers are choosing to purchase grid-connected turbines in the 1 to 10 kilowatt range to power their homes. Household generator units of 1 kilowatt or more are now installed in several countries. The amount of wind power available in the atmosphere is much greater than the current world energy consumption. A comprehensive study found the potential of wind power to be 72 terawatts - the equivalent of over five times the world's current energy use in all forms. The history of wind power has grown from humble sails and simple mills, to become one of the most important energy sources in the alternative energy markets. The total value of new generating equipment installed in 2007 was US$36 billion. While the history of wind power is already a long one, I believe the biggest part is yet to be written! The history of wind energy is still in its infancy, and we will see vast changes over the coming decades.